ROME, Ga. – As the Shorter track program continues to evolve into becoming one of the top NCAA Division II teams, it has now become the first in the nation that will run on a new state-of-the-art surfaces. 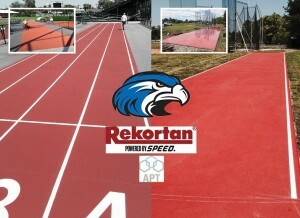 Thanks to Advanced Polymer Technology, a German-engineered synthetic Running Track & Artificial Turf Manufacturing company, and Gary Wilson, Director of Sales Americas/Turf & Track Divisions for APT Sports, Shorter and Rome has been chosen to receive the first installation in the United State of the Rekortan G 13 Gel track surface at a new 40-meter warm-up area beside the John Maddox Track at Barron Stadium and a javelin runway pad at the Riverside Throws Center. “It’s the most advanced track system in the world and we are so thankful to APT and Gary Wilson for picking Shorter and Rome to be the first in the country to have it,” Shorter Director of Track Scott Byrd said. The new surface will see its first action in two weeks when Shorter hosts the National Christian College Athletic Association (NCCAA) National Championships on May 13-14. “We are greatly indebted to APT, Rekortan and Gary Wilson for their contribution to Shorter University and the city of Rome,” Shorter Director of Athletics Kim Graham said. “The installation of the warm up lanes at Barron Stadium and the runway at the Throws Center will enhance both venues. Chemically designed with a unique Gel layer made from environmentally friendly, renewable materials and Polyurethane to provide the best shock absorption and energy return stability in the industry, Rekortan G 13 – it is IAAF certified – is a tight dense matrix of natural EPDM rubber designed for the Olympic caliber sprinter and increases force reduction, resists UV degradation and provides excellent all-weather performance. APT has developed high performance surfacing systems for every sport from professional to Olympic-level fields in hockey, soccer, football, tennis and running and track and field. Rekortan has been the official surface of the prestigious Penn Relays in Philadelphia since 1988 and following the 2015 event at Franklin Field a decision was made by the University of Pennsylvania to perform a complete track renovation and a new Rekortan surface will be in place for this year’s Relays on April 28-30.